Sharing a name with a classic Leonard Cohen song, Asghar Farhadi’s film is about dark secrets that aren’t that much of secret. There’s always gossip in the local town as the locals know more than the family thinks they know and much like the Cohen song the uncomfortable truths like ‘Old Black Joe’s still picking cotton’ are ones that everybody knows. About to arrive in this den where everyone knows of the unspoken secret is Laura (Penélope Cruz) who arrives in Spain to attend a wedding with her son and daughter (the latter of whom is kidnapped). Everybody Knows has received the smallest of fanfare for a recent Farhadi film. It’s right on the footsteps of his Oscar wining The Salesman so anticipation was high but the critics’ praise for the finished product has been a little more subdued. 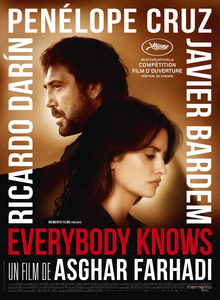 Everybody Knows is a heavyweight picture with the biggest names in Spainish and Latin America cinema in leading roles. Penélope Cruz and Javier Bardem, stars of many Hollywood movies, are in the lead roles whilst Ricardo Darín, in a major supporting role, is one of the biggest stars to come out of Argentina. They all give amazing performances and Farhadi’s script keeps the tension coming with the tumultuous story taking many twists and turns. It’s clearly a film with enough material to power two films let alone one. The family drama is packed with enough hidden secrets and long held grudges to make for a perfect drama about a bickering, dysfunctional family, whilst the kidnapping side of the story has enough potential suspects who Farhadi can teasingly make us suspect. Despite all this, however, the film never really lands on an emotional level. There is so much that works in the film’s favor that this should be the case, but it never is. There’s even a long wedding sequence that allows us to join in the fun and share this blissful moment with the family before we are suddenly brought to reality as an Earth-shattering event occurs. It feels as though the film is too packed with grudges and family secrets for the kidnapping story to land the emotional blows it should. That’s not to say there aren’t some generally powerful moments. The events following Irene’s disappearance is breathtakingly intense but the more the film focuses on family mistrust and thrown accusations the more energy is lost from the fate of the kidnapped girl. Perhaps that’s the point, the family’s fighting and accusations of past behaviors are unsympathetic as they come at a time when there are more pressing matters at hand, but it ends up weakening the film’s emotional grip on the audience. Haha. I live in London so get plenty of chances to see films like this. "the biggest names in Latin America cinema in leading roles." You mean in Spain, right?